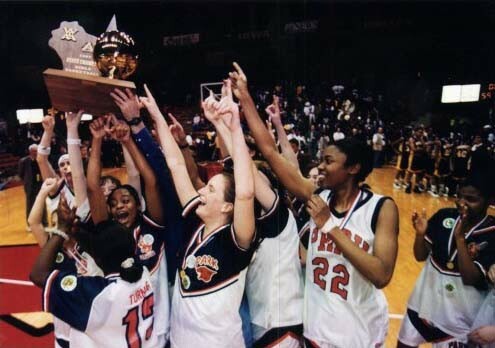 The links on the left side of this web site provide a history of Racine Park Girls' Basketball. This web site was designed in 1998 by Jim Kerkvliet. It contains information on the program from 1981 to 2009. Note: Jim Kerkvliet retired as the varsity coach of the Racine Park Girls Basketball Team after the 1999-2000 season, completing 19 years as varsity coach. He created this web site and maintained it through the 2007-08 season. Jim Kerkvliet was the Activities/Athletic Director at Racine Park High School from 2002 to 2010. He retired from the Racine Unified School District on June 30, 2010 and lives in Florida for the majority of the year. for a list of related basketball web sites such as W.I.A.A web site for tournament pairings and college web sites of former Racine Park players. More Archive newspaper articles are stored in the Archives Link on the left side of this page.